The larvae of this feed on Alphitonia excelsa and Alphitonia petriei; they are not attended by ants. Mature larvae have a flattened, pale green body with a darker green line, dense short white hairs present: head brown. 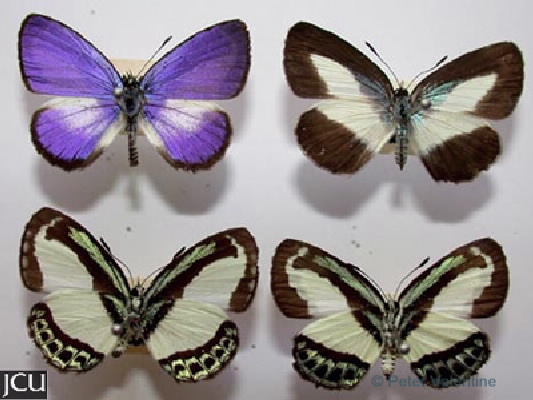 Adult male lilac-blue with back outer edges and veins, hind with a white band; female basically black, fore wing iridescent greenish-blue to blue with broad white band extending onto hind; lower surface have all wings black with white central area, an iridescent green streak present on fore wing, outer margin with iridescent green band enclosing some black spots.